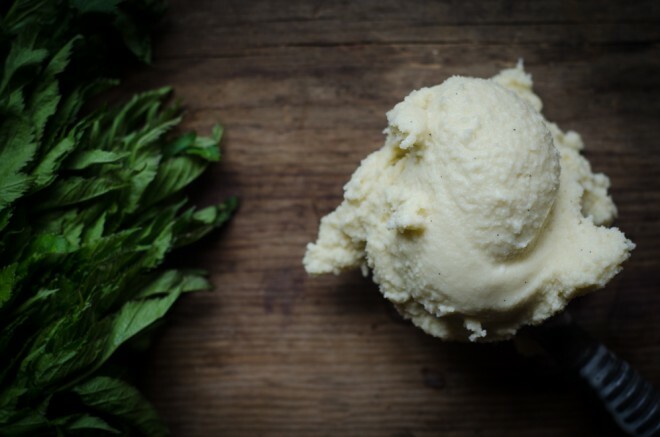 Real Vanilla Mint Ice Cream tastes of spring with lingering grassy notes that speak of fresh herbs, newly sprouted from the earth. As winter recedes and light begins to return to the mountains, the hens and cows who’ve ceased production all winter long begin to lay their eggs and give their milk and cream once more. The first eggs, milk, and cream of the year begin to arrive in March, sometimes early March and sometimes late March, and after a winter without eggs, milk, cream or fresh things to eat, I favor treats – honey custard or ice creams like this one. After six or seven months of storage, I finally pull out our ice cream maker, dust it off and set it in the deep freeze to ice over. I use this ice cream maker, and as long as I keep the insert in the deep freeze for at least a full day, the ice cream it churns comes together in about 20 to 25 minutes. I make many ice creams in the spring and summer months: strawberry, sour cherry, sweet cherry and almond, blackberry honey, rose and saffron. I favor fresh herbs, and fresh mint in particular, for flavoring my ice creams instead of extracts whose intense, assertive notes can over power the delicate flavors of milk, cream and honey. I grow most of my culinary herbs at home, tucked away in a bed of soil in little terra cotta pots. I keep them near a sunny window in the cold months and on my porch in warmer months. We also receive little bundles of herbs from a local farm where we pick up our weekly CSA – an assortment of fruits, vegetables, greens, herbs and starts. Favoring traditional herbalism, the farmers grow all sorts of odd medicinal and culinary herbs – horehound, angelica, zatar, and more mints than I can count. Each season I find myself with not only the familiar spearmint and peppermint, but the less familiar apple mint, pineapple mint, spotted mint, pennyroyal, and mountain mint. 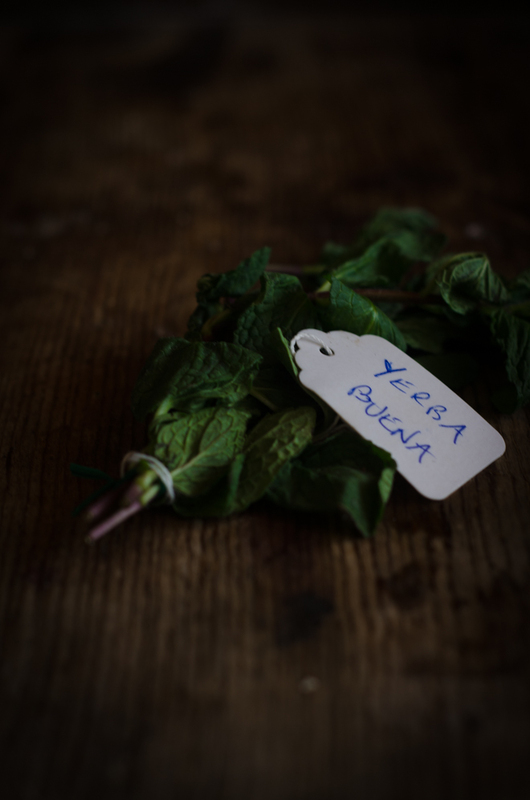 Recently I picked up a little bundle tagged yerba buena, or good herb – a term that likely applies to regional varieties of mint rather than an isolated plant. Strong and heady with the sweet and startling notes of mint, this little bundle immediately called for pairing not only with other mints, but with the floral notes of vanilla bean, too. For vanilla, I favor using whole vanilla beans or vanilla bean powder (you can find both here) over vanilla extract as they offer a fuller, rounder flavor. While some ice creams – those whose flavor depends on steeping herbs – depend also upon warmth and the very gentle application of heat, I favor keeping my milk, cream and eggs raw. When left raw and unheated, milk, cream and eggs retain their food enzymes, an array of beneficial microorganisms that support gut and immune system health, as well as naturally occurring, heat-sensitive vitamins. In our home, we favor drinking raw milk through a local dairy offering herd share arrangements. Since retail sale of raw milk is illegal in Colorado, we purchase part of a dairy herd and, as owners in that herd, are entitled to drink the milk the cows produce. This share brings us closer to our food, and helps us to ensure that the cows that produce our milk are treated well, respectfully, gently and are also raised in a way that not only honors their intrinsic nature as herbivores, but also their health as well. Our cows spend their time on the fresh grass of snow-fed mountain pastures, beneath the clear blue sky and with access to fresh water unlike the cows held in conventional dairies – tightly packed, fed a diet of corn and soy. Like all foods, raw milk, cream and eggs do not come without risk – even those from the healthiest, cleanest, grass-fed operations. Within this movement of traditional and real foods, I see leaders, long-time adherents and newcomers alike, deny the risk that these foods contain as though grass-fed raw milk or pasture-raised eggs are beyond reproach. The truth is all foods harbor risk – shellfish, ground beef, spinach, eggs, pasteurized and raw milk – but for me and for my family, it’s a risk I’m comfortable taking. 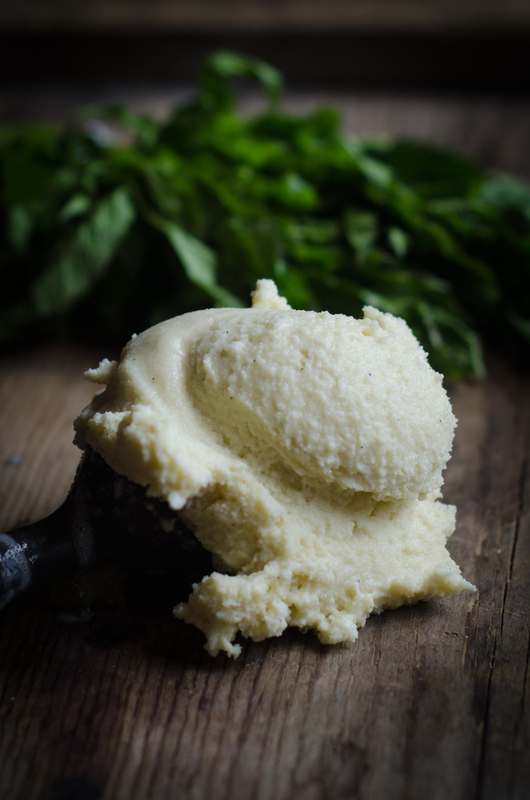 Sweetened with honey and infused with fresh mint and vanilla, this Vanilla Mint Ice Cream lacks the cloying sweetness and pronounced assertiveness of store-bought mint ice cream, relying instead on the gentle flavor and faint grassiness of fresh mint. Whisk the cream and milk together, and pour them into a saucepan set over medium-low heat. When the milk and cream begin to bubble ever so slightly at the edges of the pan, stir in the honey until it dissolves. Turn off the heat. Toss the mint into the saucepan. Take a paring knife, and cut a slit length-wise in the vanilla bean, then toss it in with the liquid ingredients and the mint. Cover the pot, and let the vanilla bean and mint steep in the sweetened milk for 20 minutes. Strain into a mixing bowl, cover it well and transfer it to the refrigerator until cold - about 2 hours. When the ice cream mix has grown cold, remove it from the fridge and whisk in the egg yolks until thoroughly combined and uniform. Pour the mix into an ice cream maker (I use this one. ), and freeze according to the ice cream maker's manufacturer's instructions. In your article before the recipe, you mention not ever heating your raw milk,cream,eggs…so in the recipe you say heat the milk and cream. Which do you do. We have been making ice cream for years and use raw milk but always heat it but does it work if you don’t heat it?? I think she means that though she does occasionally heat up her dairy for recipes such as this, in general she prefers to keep it raw. Yes – Kimmie’s right. I prefer to keep my milk, cream and egg yolks raw or lightly cooked; however, when the recipe requires them to be heated, I don’t hesitate. Heat destroys some, not all, nutrients. I think the key is balance: eat some raw, eat some fermented, eat some cooked, and enjoy your food. Is there any reason you couldn’t steep the mint and vanilla bean in only the one cup of milk, and then add the 3 cups raw cream when you add the eggs? The flavor of the mint won’t come through as well that way. 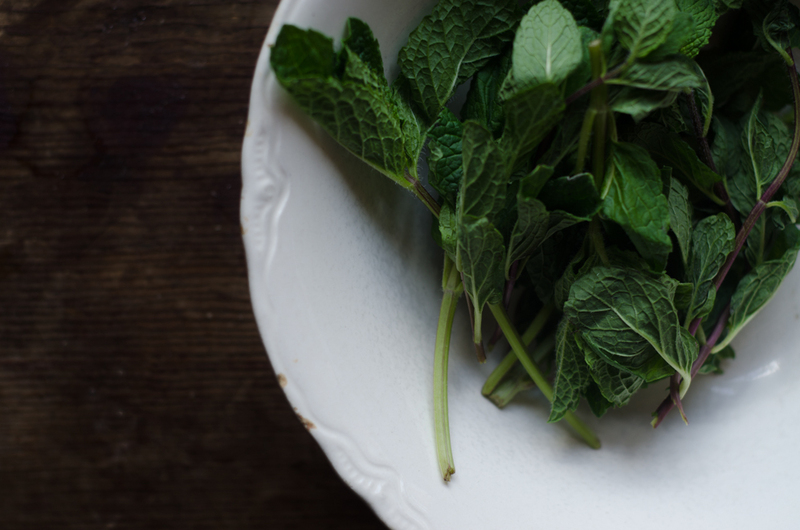 The heating of the cream is most likely so that the mint can steep resulting in a robust mint flavor. If you used cold cream the mint flavor would not come through as well. Thank you for this recipe. Thank you for mentioning the risks with any food, including raw foods. I grew up on a dairy farm and drank raw milk and cream daily. To my knowledge, we never became sick from eating our dairy. But, there is a risk of contamination even when great care is taken. I am frustrated when I hear this risk dismissed. I am equally frustrated when I hear the risk over- emphasized. Let us all just acknowledge the risk, be careful and enjoy! Yes! My feelings exactly. Don’t de-emphasize, don’t over-emphasize. Just acknowledge, and educate so everyone can make an individual choice. I have your salad book and love it. I also have your soup book and have only made chicken stock from it. I actually bought chicken feet today!! I think I will try the ice cream tonight – do you get your heavy cream raw? Butter? Yogurt? Oh (I have been saving questions) does kombucha have caffiene? I’m amazed…an entire winter without milk fresh and eggs. I have so much to learn.. I occasionally cheat, and buy some from the store – but, for the most part, we rely on what is available from farms on a season-by-season basis. Most of my sources are up in the central mountains, so if you’re on the front range it might be tough. I’d start first at farmers markets, eatwild.com and realmilk.com as well as connecting with a local weston a price foundation chapter leader. Thank you, Jenny. I have improved the way we eat in these last few years, but still buy milk / eggs / meat in the store. I make sure its grass-fed / organic but raw milk is tough to find. The closest I get is local grass-fed un-homogenized. Will definitely check WPF chapter leader! WiFarms in Berthoud, CO is a great little raw milk dairy. Wow this sounds amazing! I have an abundance of chocolate mint so I might have to get cracking on this! Chocolate mint is one of my favorites! The ice cream looks so tempting–that must have been hard to set up and shoot before it melted. I’ve just finished a 30 day challenge to improve my food photography and sketching out tricky shots first–and I think ice cream qualifies– was one of my assignments. I’ll have to check that out. Where’d you find the challenge? Hi Jenny, this looks delicious! I don’t have an ice cream maker so was wondering if this would work OK if I just put the mix in the freezer for a certain number of hours. What do you think? It probably won’t work. The scoopable texture of ice cream depends on churning. You might look up no-churn or plastic bag ice cream recipes which might offer you an alternative. Why add the eggs if it’s not going to make a true custard? Will this result in a creamier texture? I can’t wait to try this! Need to wait for my little mint plants to get a bit bigger so they can spare so many of their leaves. My question is about the amount of cream in the recipe. We only buy so many gallons of raw milk a month and there’s barely 3 cups of cream to a whole gallon. I have always read one should not drink raw milk wo the fat. I would be left w a lot of skim milk. Would the recipe work w 1 C cream and 3 whole milk? Maybe if I added an extra yolk or two? Made this last week and it was a hit. I added some rough chopped dark chocolate. I made this ice cream, and it was absolutely wonderful! Thank you! Have you tried this with a dash of salt in the past? This recipe looks great but is the first I have seen without salt. This sounds so delicious! I think I may just break out the ice cream machine this weekend and make this for my family. Can you recommend a way to replace the dairy with coconut milk/cream? Would it just be a straight replacement or some sort of blend, i.e. the milk with the cream. I’m a bit hesitant about the raw egg yolks with my grandkids eating the ice cream…. i make ice cream very close to this recipe using canned coconut milk as I choose to live dairy free. Try it! What do you do with leftover egg whites such as this one or homemade mayo?? I usually feed them to my dog because I don’t like eggs without yolks… Seems wasteful but we do have an abundance of eggs. You can make meringue out of them. This recipe sounds delicious! I would want to substitute another sweetener for honey though…any suggestions, and in what measurement? Thanks!